Yet many Americans do not look happily on the prospect of living much longer lives. They see peril as well as promise in biomedical advances, and more think it would be a bad thing than a good thing for society if people lived decades longer than is possible today, according to a new survey by the Pew Research Center. Asked whether they, personally, would choose to undergo medical treatments to slow the aging process and live to be 120 or more, a majority of U.S. adults (56%) say “no.” But roughly two-thirds (68%) think that most other people would. And by similarly large margins, they expect that radically longer life spans would strain the country’s natural resources and be available only to the wealthy. There is, at present, no method of slowing the aging process and extending average life expectancies to 120 years or more. But research aimed at unlocking the secrets of aging is under way at universities and corporate labs, and religious leaders, bioethicists and philosophers have begun to think about the morality of radical life extension, according to two accompanying reports released by the Pew Research Center’s Religion & Public Life Project in conjunction with the new survey. The findings suggest that the U.S. public is not particularly worried about the gradual rise in the number of older Americans. Nearly nine-in-ten adults surveyed say that “having more elderly people in the population” is either a good thing for society (41%) or does not make much difference (47%). Just 10% see this trend as a bad thing. The public also is optimistic that some scientific breakthroughs will occur in the next few decades. For example, about seven-in-ten Americans think that by the year 2050, there will be a cure for most forms of cancer (69%) and that artificial arms and legs will perform better than natural ones (71%). And, on balance, the public tends to view medical advances that prolong life as generally good (63%) rather than as interfering with the natural cycle of life (32%). The survey seeks to provide a glimpse into people’s initial thoughts and considerations on a subject – radically longer human life spans – that could emerge as a public issue in the future. But measuring opinion about scientific breakthroughs that may or may not come to pass is difficult. Only 7% of respondents say they have heard or read a lot about the possibility that new medical treatments could in the future allow people to live much longer; 38% say they have heard a little about this possibility, and about half (54%) have heard nothing about radical life extension prior to taking the survey. Since the scientific breakthroughs are uncertain and the public does not know much about this field, the wording of the survey question focuses on the result – much longer life spans – and is deliberately vague about how, exactly, this would be achieved. At this early stage, public reaction to the idea of radical life extension is both ambivalent and skeptical. Asked about the consequences for society if new medical treatments could “slow the aging process and allow the average person to live decades longer, to at least 120 years old,” about half of U.S. adults (51%) say the treatments would be a bad thing for society, while 41% say they would be a good thing. But most doubt that such a breakthrough will occur anytime soon. 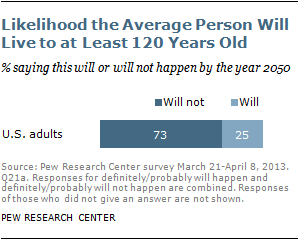 When asked about the future likelihood of “the average person” in the United States living to at least 120 years, nearly three-quarters (73%) say it either probably or definitely will not happen by the year 2050. Just a quarter of adults (25%) consider it likely to happen by 2050. The public also is skeptical about the fairness of these kinds of potential medical interventions. An overwhelming majority believes that “everyone should be able to get these treatments if they want them” (79%). But two-thirds think that in practice, only wealthy people would have access to the treatments. Opinion is more divided over whether “our economy would be more productive because people could work longer;” 44% agree, while about half (53%) reject this idea. Views on the likely impact of radical life extension on society vary somewhat by age, race and ethnicity. Blacks and Hispanics are more likely than whites to see radical life extension as a positive development for society. And younger adults are more inclined than those 50 and older to say that radical life extension would be a good thing for society. But there are few differences in opinions across other social and demographic groups. Men and women are about equally likely to say that radical life extension would be a good thing for society. There are only modest differences across education and income groups, with those who have less formal education and lower incomes somewhat more inclined to say radical life extension would be a positive development for society. Older adults account for a growing share of the U.S. population. Roughly 41 million Americans are 65 and older, and they make up about 13% of the total U.S. population, up from 4% in 1900.4 The growth in the share of older people in the population over the past century stems from dramatic advances in public health and medical care as well as steep declines in fertility rates. The share of the population that is 65 and older is growing at a faster pace than other age groups, fueled primarily by the aging of the nation’s 76 million baby boomers. 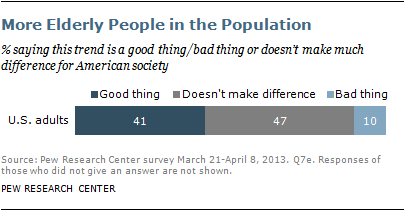 The new Pew Research survey finds that the public views this trend in American society as more positive than negative. About four-in-ten (41%) adults consider “having more elderly people in the population” a good thing for society. Just 10% say this is a bad thing, and 47% say it doesn’t make much difference. The overall average life expectancy in the U.S. at present is 78.7 years, although women tend to live longer (81.0 years) than men (76.2 years).5 Given the option, most Americans would choose to live longer than the current average. 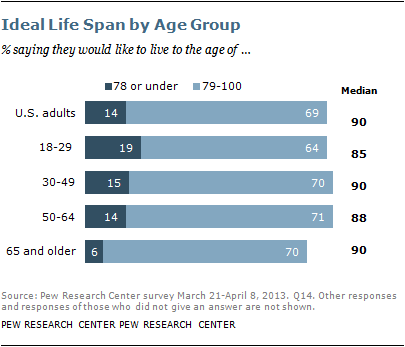 Fully 69% of American adults would like to live to be 79 to 100 years old. 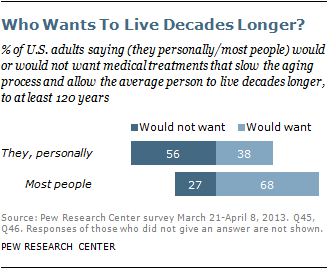 About 14% say they would want a life span of 78 years or less, while just 9% would choose to live more than 100 years. The median ideal life span is 90 years. Younger adults, to whom old age may seem far away, are more likely than those 65 and older to give an ideal age of 78 years or less (19% vs. 6%). The median ideal life span of adults under 30 – at 85 years – is lower than that for older adults. Relative to whites and Hispanics, blacks are especially likely to say they would choose a longer life span (median of 94 years). 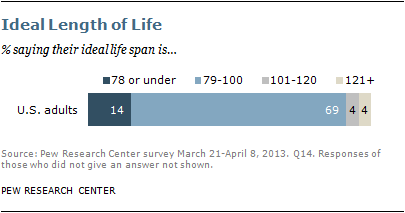 But whether respondents are male or female, their median ideal life span is roughly the same. And there are no significant differences in the median ideal length of lifetime by education. Overall attitudes about medical treatments are, not surprisingly, closely related to views about the likely effect of medical treatments that would radically extend the life span of human beings. Those who see medical advances in generally positive terms are also more inclined to view radical life extension as a good thing for society, and vice versa. 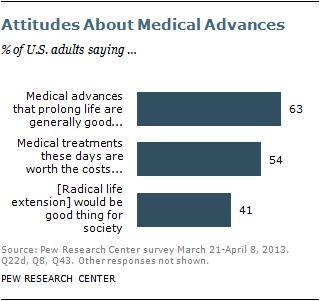 There are mostly modest differences among religious groups in their views on medical advances in general. 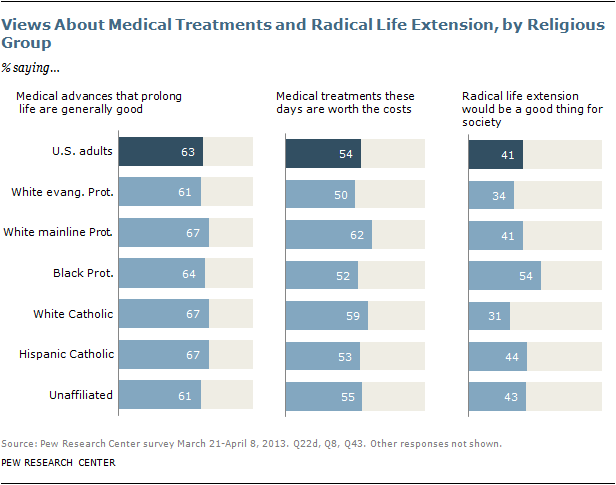 Majorities of all large U.S. religious groups consider medical advances that prolong life as generally good.6 About half or more of adults in all the major religious groups also say that medical treatments these days are worth the costs because they allow people to enjoy longer, better-quality lives. About six-in-ten white mainline Protestants (62%) and white (non-Hispanic) Catholics (59%) hold this view, compared with about half of white evangelical Protestants (50%) and black Protestants (52%). About half or more of Hispanic Catholics (53%) and the religiously unaffiliated (55%) also say that medical treatments these days are worth the costs. However, there is a different pattern across religious groups when it comes to attitudes about the possibility of slowing the aging process and radically extending life. Black Protestants are among the most likely to say radical life extension would be a good thing for society (54% do so). By contrast, fewer white evangelical Protestants (34%) and white Catholics (31%) say the same. Hispanic Catholics (44%) are more likely than white Catholics (31%) to think that much longer life spans would be a good thing for society. 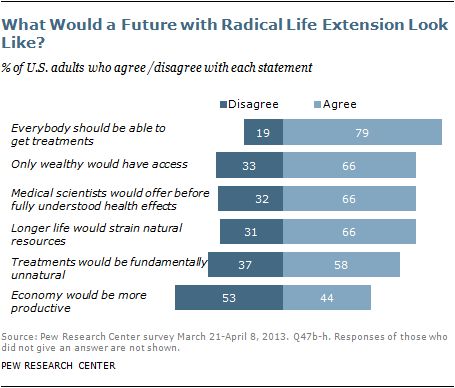 Among the religiously unaffiliated, 43% say radical life extension would be good for society, and 51% say it would be bad for society. About four-in-ten (41%) white mainline Protestants say radical life extension would be a good thing, while 52% say it would be a bad thing for society. While only a minority of U.S. adults have heard about the possibility of radical life extension, those who report having heard at least a little about it are relatively more inclined to see it in a positive light. And those who expect scientific developments to dramatically increase average life spans in the next 40 years also are more inclined to view radical life extension as good for society and to say they personally would want life-extending treatments. The survey contains a number of null findings that may be surprising. It turns out, for example, that many standard measures of religious beliefs and practices, including belief in God and frequency of attendance at religious services, are related to views on radical life extension only weakly, if at all. Nor is there a strong relationship in the survey between the gender, education or political party identification of respondents and what they say about longer human life spans. At least one question that deals directly with death, however, is correlated with views on radical life extension. People who oppose the death penalty are more inclined to say that longer life spans would be good for society. Beliefs about medical advances in general also are predictive of where people stand: those who think medical advances are generally good are more likely to view radical life extension in positive terms and to say that they personally would want life-extending treatments. The rest of this report details the survey’s findings on radical life extension and related attitudes toward aging, medicine, personal life, religion, and moral and social issues. 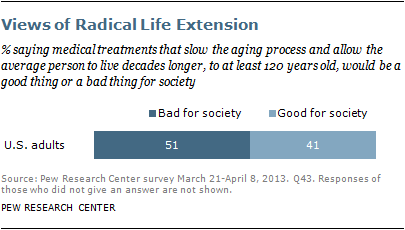 The first section looks at Americans’ initial thoughts about the desirability and impact of radical life extension. The second section covers views on radical life extension by religious affiliation, beliefs and practices. The third section looks at the public’s views on aging in general. The fourth section explores attitudes toward medical treatments available today and the relationship of those attitudes to the public’s views on radical life extension. The fifth section looks at personal life satisfaction as it relates to attitudes about longevity. The sixth section considers the morality of some social issues – including views on abortion, stem cell research and the death penalty – and how those views are related to the public’s early thinking about the possibility of radically longer life spans. The seventh section provides an overview of the similarities and differences across racial and ethnic groups on views about radical life extension and beliefs about aging, medicine and personal life. What’s the Science Behind Radical Life Extension? And What’s the Religious Debate? Interactive: How Long Do You Want To Live?